The amount of the gas in the atmosphere, which could not be detected using previous techniques, had been estimated at less than 1,200 metric tons in 2006. The new research shows the actual amount was 4,200 metric tons. In 2008, about 5,400 metric tons of the gas was in the atmosphere, a quantity that is increasing at about 11 percent per year. Different generations of collection cylinders used to collect air samples from locations around the world over the past 30 years. 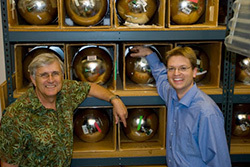 Scripps Institution of Oceanography at UC San Diego geochemistry researchers Ray Weiss and Jens Muehle led a study that found that the greenhouse gas nitrogen trifluoride, used in the manufacture of flat-panel monitors, escapes to the atmosphere at levels much higher than previously assumed. "Accurately measuring small amounts of NF3 in air has proven to be a very difficult experimental problem, and we are very pleased to have succeeded in this effort," Weiss said. The research will be published Oct. 31 in Geophysical Research Letters, a journal of the American Geophysical Union (AGU). Emissions of NF3 were thought to be so low that the gas was not considered to be a significant potential contributor to global warming. It was not covered by the Kyoto Protocol, the 1997 agreement to reduce greenhouse gas emissions signed by 182 countries. The gas is 17,000 times more potent as a global warming agent than a similar mass of carbon dioxide. It survives in the atmosphere about five times longer than carbon dioxide. Current NF3 emissions, however, contribute only about 0.04 percent of the total global warming effect contributed by current human-produced carbon dioxide emissions. The Scripps team analyzed air samples gathered over the past 30 years, working under the auspices of the NASA-funded Advanced Global Atmospheric Gases Experiment (AGAGE) network of ground-based stations. The network was created in the 1970s in response to international concerns about chemicals depleting the ozone layer. It is supported by NASA as part of its congressional mandate to monitor ozone-depleting trace gases, many of which are also greenhouse gases. 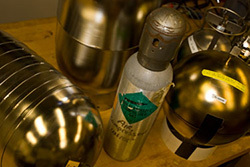 Air samples are collected at several stations around the world. The Scripps team analyzed samples from coastal clean-air stations in California and Tasmania for this research. 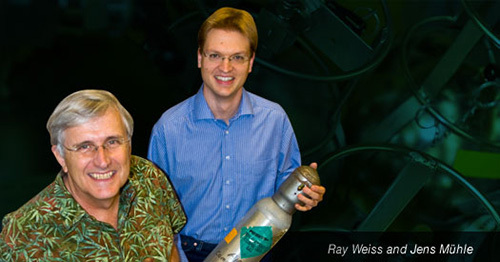 Scripps geoscientists Ray Weiss (green shirt) and Jens Muehle amid collection cylinders used to collect air samples from a variety of locations around the world. Weiss and Muehle led a study that found that the greenhouse gas nitrogen trifluoride, used in the manufacture of flat-panel monitors, escapes to the atmosphere at levels much higher than previously assumed. “This result reinforces the critical importance of basic research in determining the overall impact of the information technology industry on global climate change, which has already been estimated to be equal to that of the aviation industry,” added Larry Smarr, director of the California Institute for Telecommunications at UCSD, who was not involved in the Scripps study.